Roham is a PhD student within the research group Geometry Assurance & Robust Design. The focus field of his research is geometry assurance of non-rigid and complex assembled products. His research is in collaboration with Volvo Cars where the aim is to optimize the methods and simulation tools used for non-rigid assembly simulation. 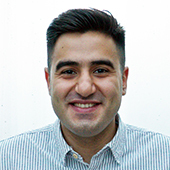 There might be more projects where Roham Sadeghi Tabar participates, but you have to be logged in as a Chalmers employee to see them.